Reproductions of Sally Jackson artisan cheeses. 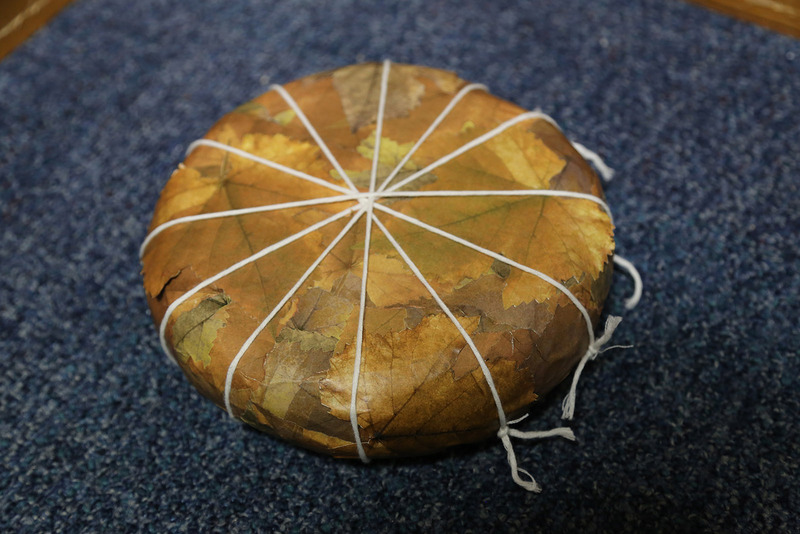 Goat cheeses were wrapped in grape leaves, while sheep and cow cheeses were wrapped in chestnut leaves. Both types of leaves were from the trees surrounding the facility. Sally Jackson gourmet raw milk sheep, goat, and cow milk cheeses, ready to be aged. Oddly, none of the cases in this outbreak ever recalled the cheese by the brand name, even after investigators deduced the brand of cheese and questioned the cases about it specifically. It was fortunate that investigators could make a compelling case with largely circumstantial evidence that was later bolstered by laboratory and environmental evidence. Following a recall, the Sally Jackson facility closed permanently. On December 6, 2010, routine follow-up interviews, conducted by the Oregon Public Health Division, on 2 patients diagnosed with E. coli O157 infection with indistinguishable PFGE patterns, positive for both Shiga toxins stx-1 and stx-2, revealed that they had both patronized ClarkLewis a local farm to table-style restaurant in Portland, Oregon. Menus were reviewed, and the only item in common to both cases was an unspecified selection of artisanal cheeses. As the chef was not able to identify which cheeses were served on cases’ meal days, Oregon Public Health Division staff reviewed their invoices from the past 2 weeks to determine which cheeses could have been served. Staff also queried the national laboratory network, PulseNet, to identify possible additional cases. 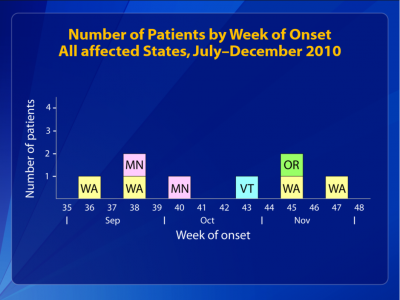 Cases were defined as patients with PFGE-matching E. coli O157 isolates since July 2010. Investigators reviewed interview records; menus; sales records; and shipping invoices from restaurants, retailers, and food distributors; patients were reinterviewed as necessary. Food samples were assayed. Eight cases were identified from Oregon (1); Washington (4); Vermont (1) and Minnesota (2). Median age was 39 (range, 22–69) years, and 5 were female. 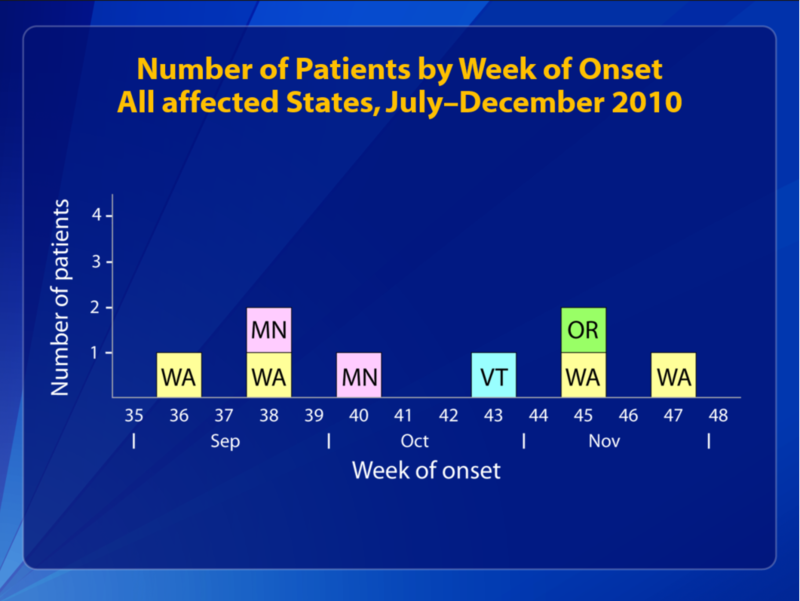 All patients had diarrhea with onset during September–November 2010. Two patients were hospitalized; none had HUS; none died. One Washington State resident was lost to follow-up. 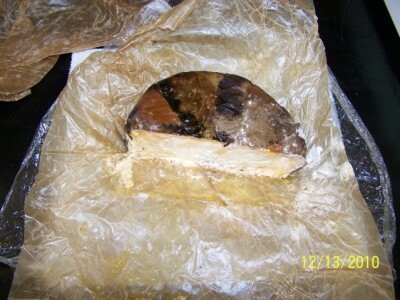 The Oregon resident and one Washington resident reported cheese exposures at ClarkLewis on November 12 and November 13, 2010; 8 different artisanal cheeses were potentially served those days. One Washington resident reported consumption of cheeses at a wedding in northeastern Washington on September 5, 2010, where locally bought goat, sheep and cow cheeses where served; the Sally Jackson facility was located a few miles from the northeastern Washington wedding location. Another Washington resident tasted various artisanal cheeses at Calf & Kids cheese shop in Seattle on November 21. The Vermont resident had visited a relative in Washington State and partook of a cheese plate at Palace Kitchen restaurant in Seattle on October 23, 2010. The 2 Minnesota residents had onset dates of September 26 and October 8, 2010; one was a member of a cheese club, and the second recalled having eaten artisanal cheeses. Altogether, 7 cases reported consumption of artisanal cheeses, but none recalled specific varieties or brands. Invoices from ClarkLewis suggested 8 cheeses that could have been served, including Sally Jackson raw goat cheese. Review of invoices from the distributor indicated that Sally Jackson cheeses were also sold at Calf & Kids in Seattle and at Palace Kitchen. Invoices from Palace Kitchen indicated that they could have carried Sally Jackson’s raw sheep cheese when the Vermont resident ate there. The Sally Jackson distributor also supplied ClarkLewis, and invoices indicated that the cheeses were sold to ClarkLewis on November 10 (and potentially served on November 12 and 13). 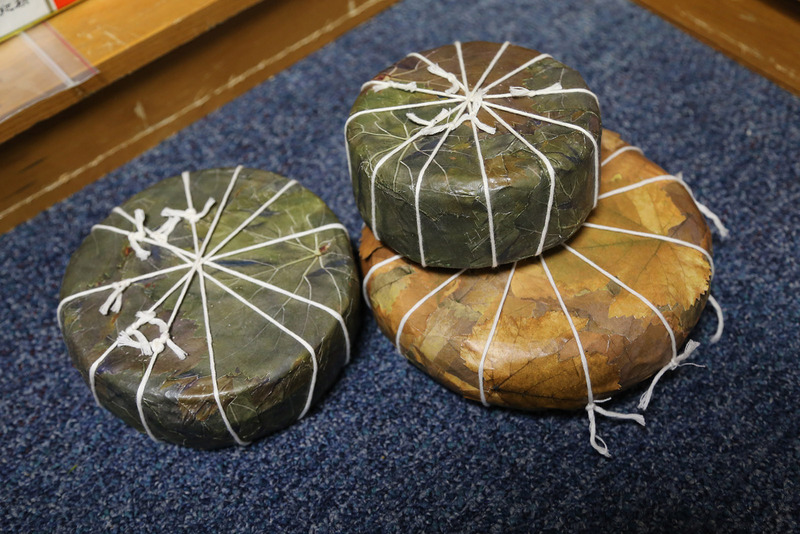 Those cheeses had been received by the distributor on September 28, indicating that a single contaminated batch released for consumption in September could have accounted for all cases. Three additional restaurants (2 in Washington, 1 in Oregon) that received the same September batch were identified, and leftovers were collected for testing. Based on this information, investigators decided to visit the cheese production site to assess whether any violations were occurring that might contribute to the contamination of the cheese. Officials of the Washington Department of Agriculture (WDA) and the U.S. Food and Drug Administration (FDA) visited the Sally Jackson facility on December 10, 2010. 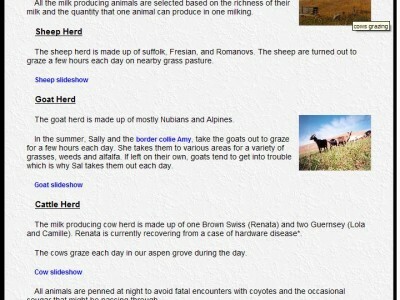 Sally Jackson was producing raw milk cheeses from its own goats, sheep and cows. 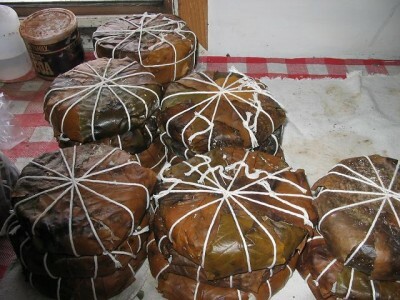 Goat cheeses were wrapped in grape leaves, while sheep and cow cheeses were wrapped in chestnut leaves. Both types of leaves were from the trees surrounding the facility. 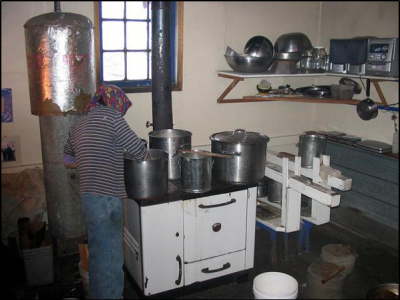 Multiple hygiene violations were identified, including improper handwashing after contact with livestock (before making cheese); kitchen well-water source for food and food surfaces that was not in microbiological compliance; unsanitary non-food areas (e.g., manure on the floor, black mold deposits on the ceiling); suitable outer garments not worn (owner wore manure-soiled clothing during cheese production). Cheeses were unlabeled, and no lot or code numbers had been assigned. 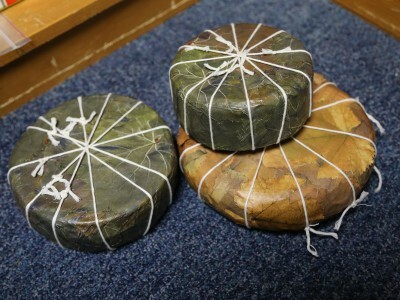 The owner was unable to identify the production dates of the cheeses but was able to identify those aged more than 60 days and those less. 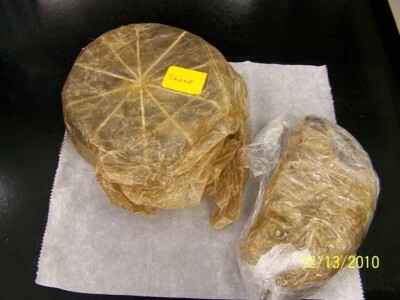 Employee food handling and hygiene practices were reviewed, potential source of contamination were assessed, and multiple cheese samples were collected for testing. Despite the fact that no cases could name a specific cheese product and before any laboratory results were available, suspicion was sufficient to take public health actions. Sally Jackson had a limited but multi-state distribution and voluntarily recalled products nationwide on December 20, 2010; FDA released the information to the news media. PFGE-matching E. coli O157 was subsequently cultured on December 20 from raw cheeses collected at the Sally Jackson facility and restaurants. The bride’s family confirmed that the cheeses served at the wedding had been bought from Sally Jackson, and invoices from the distributor in Minnesota indicated that the 2 Minnesota cases could have been exposed to Sally Jackson products. Sally Jackson cheeses were the source of this outbreak of E. coli O157:NM. Though the raw milk could have been contaminated at the timing of milking, direct raw milk contamination also could have occurred as multiple obvious hygiene violations were identified (i.e., improper handwashing, manure-soiled clothing). 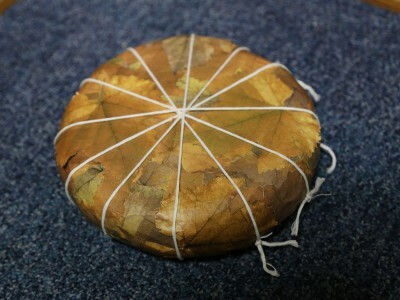 Additionally, the cheeses could also have been contaminated from the leaves in which they were wrapped. Following the recall, the Sally Jackson facility closed permanently.